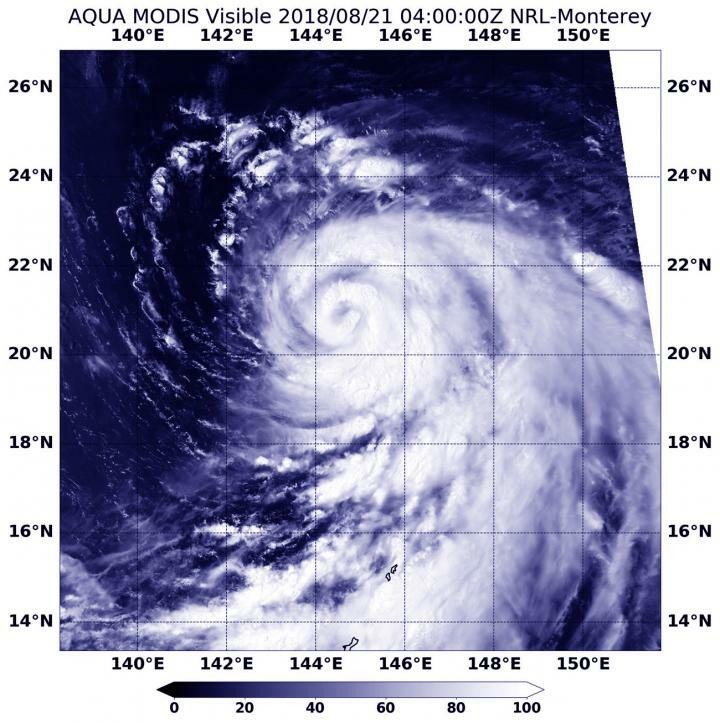 Bands of thunderstorms were spiraling into the center in Typhoon Cimaron when NASA's Aqua satellite passed overhead on Aug. 21. On Aug. 21 at 1200 a.m. EDT (0400 UTC) the Moderate Resolution Imaging Spectroradiometer or MODIS instrument aboard NASA's Aqua satellite captured a visible light image of Cimaron. The visible image showed bands of thunderstorms spiraling into the low-level center of circulation. It also revealed thick bands of thunderstorms wrapping from north to east to south of center. At 11 a.m. EDT (1500 UTC) on Aug. 21, Cimaron had maximum sustained winds near 92 mph (80 knots/148 kph). It was located near 22.6 degrees north latitude and 142.1 degrees east longitude. That's approximately 187 nautical miles south-southeast of Iwo To Island, Japan. Cimaron has tracked toward the northwest. Cimaron is expected to reach peak strength on Aug. 22 and then begin a slow weakening trend. The Joint Typhoon Warning Center forecast calls for Cimaron to track to the northwest and make landfall in central Japan near Kyoto sometime on Aug. 23.